This section is from the book "The Better Homes Manual", by Blanche Halbert. Also available from Amazon: The Better Homes Manual. Foremost in that program have been the planning, building and equipping of a labor-saving kitchen, so that our readers may have a visible demonstration of the latest principles in housekeeping technique and may carry away suggestions for the improvement of their own kitchens. This true home laboratory has been planned by Dr. Lillian Gilbreth, the foremost home engineer in the country and a member of the Institute's Advisory Council. 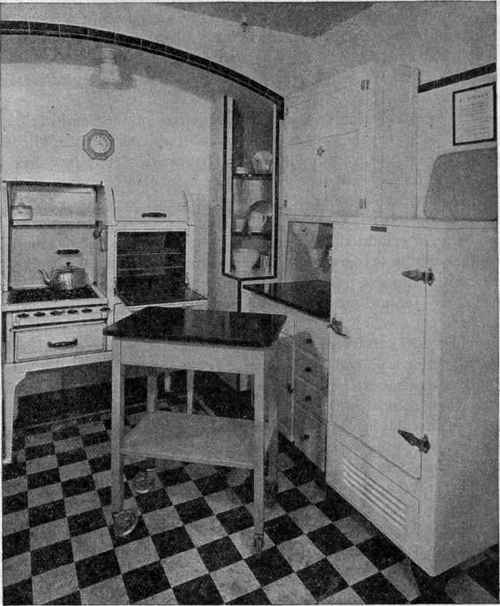 It is not offered as a rigid model for all kitchens, for one of the first rules for the efficiency of any plan is that it must be adaptable, and Dr. Gilbreth's wide practical experience leads her to insist that every kitchen should be individually arranged to suit the height, tastes in decoration, working habits and pocketbook limitations of the woman destined to be its mistress. In its design this kitchen has, however, demonstrated two basic labor-saving principles which can be followed in the laying out of any work place. These principles are: i. Working surfaces adapted to fit the height of the worker. 1 From "Glorifying the Kitchen," New York Herald Tribune Magazine, June 15,1930. 2 Adapted from "Test Your Kitchen by Ours," New York Herald Tribune Magazine, June 15, 1930. No woman who has labored for even five minutes in an inefficient kitchen needs to be told that the most exhausting part of dishwashing, ironing and any other task usually done standing, is the constant bending over. It is a tragedy and a reproach that for hundreds of years feminine backs have ached so unnecessarily. Even to-day the evil is far from cured, for not all women have learned that there are ways in which kitchen equipment may be adjusted to individual heights. As the result of the work of women like Dr. Gilbreth, all up-to-date kitchen equipment will probably in time be made with easily adjustable legs, but until that time comes there are various expedients by which the housewife may meet the difficulty. The Institute kitchen was planned for a housekeeper five feet seven inches high, since that is the height of the food expert on the Magazine staff. The desirable work level for her was found to be thirty-six inches, which was the distance from the floor to the tips of her fingers when she was standing with shoulders relaxed and elbows bent in a normal and comfortable working position. This meant that the stove, the rim of the sink, the work surface of the cabinet and the tables had to be thirty-six inches from the floor. The height of the work stool also had to be adjusted, so that when the housewife is sitting, her hands are in the same relative position with regard to the equipment as when she is standing. Most manufacturers make cabinet and table tops approximately thirty-one inches high. This means that for the taller woman they must be raised. This can be done by means of casters, rubber-tired wheels, caster cups or more drastic measures. The legs of the Institute's stove are placed on wooden blocks; the cabinet has a built-in baseboard; the work tables are on wheels; the sink is supported by a wooden cupboard. For the very small woman these processes may be reversed, as it is possible with most equipment to saw off enough of the legs to bring them to the right height. If the sink is too high for a very short woman' she should have a small wooden platform built in front of it, on which she could stand while washing dishes or pots and pans. Dr. Gilbreth's second efficiency principle, that of circular routing, is based on a long and careful study of kitchen processes and experiments with many kinds of kitchen arrangements to find out which plan would eliminate all the unnecessary motions. The arrangement in the Institute kitchen has been given a practical test by which it was proved that this plan had cut almost in half the number of motions required in preparing any given dish, and had reduced to less than one-sixth the amount of walking required. Fig. 6i.-Circular routing of work is one of the efficiency principles of the Herald Tribune kitchen designed by Dr. Lillian Gilbreth. The Institute is not opposed to walking and exercise for the woman of the family-far from it! But we do maintain that she should take that exercise in the open air, rather than in a treadmill round of refrigerator to sink, to stove and back again. The test of the efficiency of the new kitchen was made with strawberry shortcake, because this dish and its twin, peach shortcake, are both fairly complicated and popular.....The cake was first made in a typically haphazard kitchen. We kept a record of every motion and every step taken in this process. Then an exactly similar shortcake was prepared in the Herald Tribune Kitchen, which has the same equipment and utensils as the other kitchen, but has them arranged for efficiency. The results of this test were so startling as to be almost unbelievable. The number of kitchen operations had been cut from 97 to 64. The number of actual steps taken had been reduced from 281 to 45 - less than one-sixth! This great gain in kitchen efficiency is based on the idea of grouping together, within easy reaching distance, furniture and equipment which are used in the same processes or in processes which immediately follow each other. In meal preparation, for example, the housekeeper starts to assemble her cooking utensils at the cabinet and cupboard. Then she assembles the foods from the refrigerator and cabinet, prepares them at the cabinet or sink, and places them in or on the range. It follows that if an arrangement can be made which will put her within easy distance of refrigerator, cabinet, sink and stove, her tasks will be greatly simplified. When a meal is being prepared the worktable on rubber-tired wheels is wheeled over to the work center and stands there. The housekeeper stands or sits on a high stool. From there she can reach her stove, her staple foods in the cabinet, her perishable foods in the refrigerator and her worktable. A few short steps take her to the sink. On the built-in shelves at each side of the stove she keeps utensils needed for the stove - on the left, pots and pans for boiling and frying; on the right, dishes for baking and extra bowls used to supplement those in the cabinet. The cupboards under the sink conceal a vegetable bin (placing vegetables close to where they would naturally be cleaned), a garbage container (close to the electric dishwasher which is a part of the sink) and the various cleansers and implements used for cleaning the sink. In this cupboard two little drawers hold vegetable knives and brushes. A unique feature of the Institute kitchen is the door closet to hold cleaning equipment used in the kitchen. This is a Herald Tribune Institute invention, made especially for the model kitchen, but answers such a long felt need that it is already destined to a wide popularity. It is a curved metal pocket, fastened to the door with hinges and opening to reveal a compartment for these necessary but undecorative objects. It has places for floor mop, broom, brushes, ammonia and dusters. The outside is painted the color of the door, but the inside is enameled black. When closed the door closet extends only six inches beyond the door to which it is attached. The housekeeper's planning desk is another crowning achievement in efficiency. 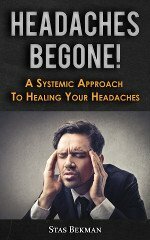 It is Dr. Gilbreth's belief that the business of running a house demands a well-planned little "office" just as surely as does any business run by a man. For this reason she has designed the desk.....It is a place to make up menus, to telephone market orders and to pay bills. It" is 12 inches deep by 26 inches wide. The front drops to reveal a telephone and two small drawers, one for paid, one for unpaid bills. The top shelf holds recipe books and the Herald Tribune box of tested recipes; on the second shelf is the radio, with the loud speaker built in above. The Institute feels that the radio has a definite place in the modern kitchen, contributing not only to the happiness of the housekeeper but to her efficiency, since it enables her, without leaving her work, to listen in on much of the useful and interesting information about her job which is now being broadcast, and glorifies many of the common tasks of the kitchen by a musical accompaniment. It has long been realized that marching soldiers forget their fatigue when the band is playing. Indeed, much of our music and even our speech has evolved from the rhythmic sounds of laboring men working in unison, and the arm that beats a cake does so with less realization that it is work if the movements are timed to the beat of a waltz. The Institute also believes that the telephone is a necessary adjunct to efficient homemaking. Personal marketing should be done twice a week, but the telephoned grocery order can never be entirely dispensed with. The final convenient feature of the planning desk is its bottom drawer, in which is kept a small tool kit containing screws, nails, hammer, screwdriver and other implements necessary for quick repair work. To the right of the planning desk is a drop-leaf table and four gaily painted chairs, where the family of four, for whom the kitchen was planned, may breakfast, or where the children may eat lunch while mother goes on with her work. If the architecture of the kitchen allows, this may be replaced by a breakfast nook with built-in table and benches. The outside door is, in this arrangement, at the end of the room exactly opposite the stove. To one side of it a hanging cupboard holds the big serving dishes and everything necessary for breakfast. Under the cupboard stands another worktable on wheels, its black composition top, which is impervious to burns, the alcohol in flavoring extracts or other stains, ready to hold the serving dishes while they are transported to the stove and then into the dining room. The kitchen doubtless has become the most standardized room of the entire house. In considering the plans, the oblong kitchen is better suited for the saving of space and the arrangement of equipment than the square kitchen. Easy access from the kitchen to front and back doors, stairs, cellar, and telephone is desirable. More doors than essential should be avoided as wall space is necessary for the placing of equipment. Cross ventilation or a ventilating fan is desirable. Windows placed high provide more usable wall space, and if opened from the top they are effective in eliminating odors. Improper lighting or not enough light on work surfaces causes irritation and fatigue. Kitchen walls and woodwork should be smooth, free from cracks, easy to clean, and attractive. There should be as little woodwork as possible, and it should be plain to prevent collection of dust. Round corners are desirable. The kitchen floor should be durable, comfortable to walk and stand on, smooth, easy to clean, and attractive in appearance. It is well to build cupboards to the ceiling to prevent collection of dust and also to provide for plenty of storage space. A separate working surface for each kind of work to be done is desirable. Large equipment should be arranged in step-saving sequence, and each working area should be compact. Sinks cast in one piece with drainboards are preferable to drain-boards attached. The design and placement of sinks, however, are usually of more importance than the material. Equipment should be placed at convenient heights from the floor. Small equipment should be grouped around the working center where it is used. It is desirable to have cupboard shelves adjustable, not too wide, and if used with a worktable unit they should be at least sixteen or eighteen inches above the worktable. Common materials used for worktable tops are wood, porcelain, enameled iron, linoleum, and composition materials. Drawers should be planned with reference to their use; they should not be too deep and should operate with ease. The most satisfactory kitchen utensils include wares of each type. In selecting new utensils consider durability, design, size of family, and amount of entertaining, also uses of article and standard makes. Handles should be securely attached and able to withstand the weight, and the article should be free from crevices and difficult places to clean.